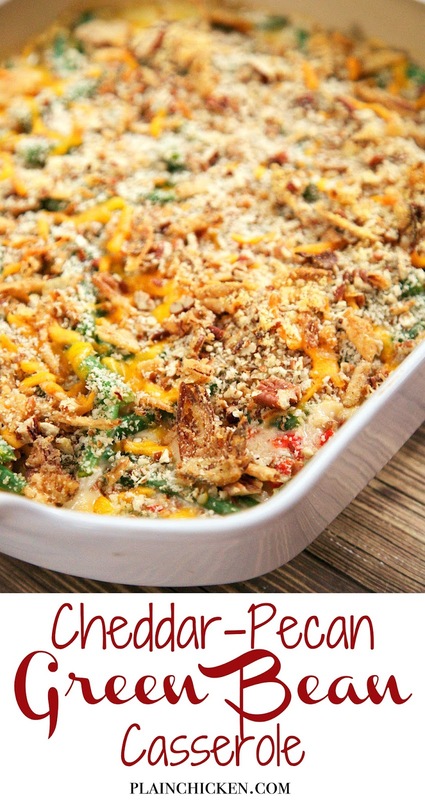 Cheddar-Pecan Green Bean Casserole Recipe - no cream of anything soup!! 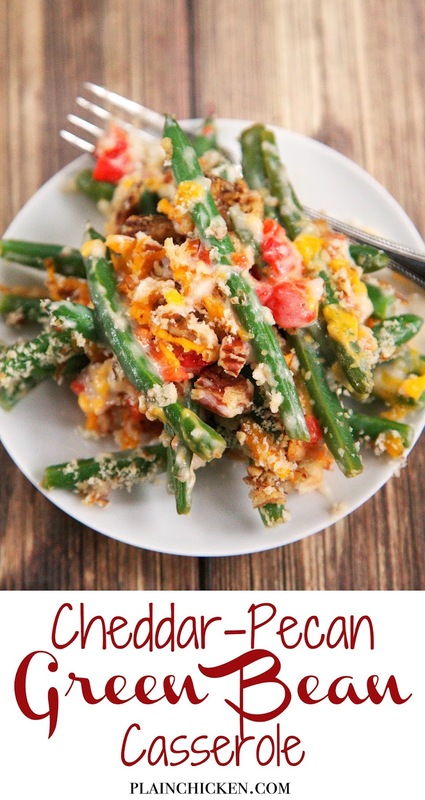 Cheddar-Pecan Green Bean Casserole - no cream of anything soup!! Fresh green beans and roasted red peppers tossed in a yummy buttermilk ranch sauce and topped with cheddar, pecans, and french fried onions. 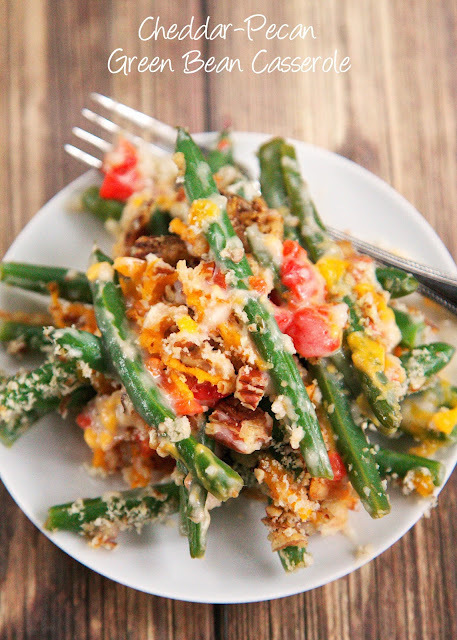 Not your grandmother's green bean casserole. 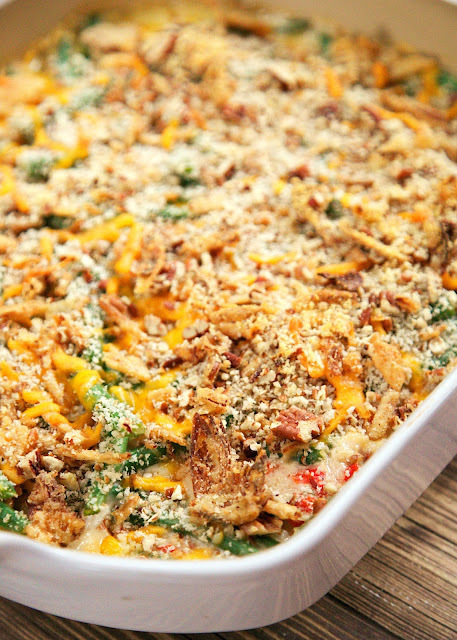 This casserole is to-die-for! Can make the buttermilk ranch sauce and blanch green beans ahead of time for easy holiday meal prep! I'm going to be sharing several side dishes for Thanksgiving and Christmas dinner this month. First up is this Cheddar-Pecan Green Bean Casserole. This is not your grandma's green bean casserole. There is no cream of anything soup. The fresh green beans and roasted red peppers are tossed in a yummy buttermilk Ranch sauce and topped with cheese, pecans and french fried onions. This is the best green bean casserole I've ever eaten. I could have made a meal out of it! The Buttermilk Ranch Sauce and blanched green beans can be made two days in advance and stored in the fridge until you are ready to make the Cheddar-Pecan Green Bean Casserole. I love holiday recipes that can be prepped ahead of time! It helps reduce the stress of preparing the holiday meal. Preheat oven to 350ºF. Lightly grease a 9x13-inch pan with cooking spray. Set aside. Cook green beans in boiling water for 6 to 8 minutes. Drain. While the green beans cook, prepare the Buttermilk Ranch Sauce. In a medium saucepan, melt 2 Tbsp butter over medium heat. Whisk in 1/4 cup flour until smooth. Cook for 1 minute. Gradually whisk in 1 1/2 cups milk, cook for 3 to 4 minutes, whisking constantly, until thickened and bubbly. Remove from heat and whisk in 1/2 cup buttermilk, Ranch mix, salt and pepper. Combine buttermilk ranch sauce, roasted red peppers,1/2 cup cheese and green beans in a large bowl; toss gently to combine. Pour into prepared baking pan. Combine French fried onions, panic breadcrumbs, chopped pecans, and remaining 1/2 cup cheese, and sprinkle over green bean mixture. Bake for 25 to 30 minutes or until golden brown and bubbly. Serve immediately.